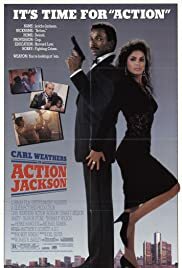 Action Jackson: [cutting off Dellaplane] -It's ACTION! I did a quick search on the internet to see if my memory served me right, and apparently it has. By 1981, the Blaxploitation action film was exhausted. - Although Fred Williamson had made a couple of action films in the mid-'80s, these don't really count, because Williamson can't act and can't direct. The good news was that African-American cinema could say farewell to a stereotype; the bad news was that Hollywood wanted to find some way to say farewell to African-American cinema. The mid-'80s were lean years for anyone with dark-skin in Hollywood. One of the problems had been that people critical of blaxploitation had missed the fact that Hollywood only does two type of films with any regularity, the action film (Western, Sci-Fi, crime, etc.) and the sit-com (domestic comedy). The notion that Hollywood does dramatic or otherwise serious films is a myth Hollywood likes to drag out at the Academy Awards. So if you're not making action films or comedies, you're not in Hollywood. By the late '80s it was clear to everyone that African Americans (now constituting a sizable portion of regular movie audiences) were going to have to be represented on film again. But by then it was also clear that this audience wasn't going to tolerate being relegated to pimp and gang roles, at least not completely. For one thing, Eddie Murphy had broken the blaxploitation mold in 48 Hours and Beverly Hills Cop. I don't think anybody realizes that Murphy's roles in these films are a basic blaxploitation stereotypes, because Murphy clearly wasn't going to let himself be stereotyped. Murphy's popularity and savvy probably caused more anxiety than the anger of Melvin Van Peebles or Richard Pryor ever had, because it was clear that he was there to make money, something Hollywood could really understand. At any rate: In 1988 the Wayans produced I'm Gonna Git You Sucka, a knock-down parody of the blaxploitation genre that pretty much assured that it would never raise its afro-covered head again. But it was still clear that African Americans needed a new action hero; so enter Action Jackson. The reason why this film is not better remembered as the return of the black action hero is clearly because of the script. This is paint-by-numbers formula movie-making; this script has been written and filmed a hundred times, and every action star in Hollywood has appeared in some version of it, all of the Baldwin brothers in turn, Sly Stallone, Kirk Russell, Seagal, Schwarzenegger, Brandon Lee - I'm sure the reader can fill in the titles of each actor's version, regardless how unmemorable the films may have been. This formula was a kind of rite-of-passage for anyone wanting to make action films in the late '80s - early '90s. 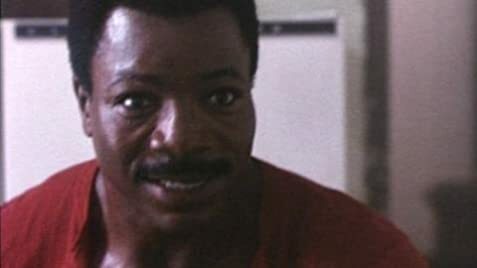 So why not Carl Weathers? Actually, Weathers' performance in this film is quite good. It's hard to come up with a bone-breaking/rule-breaking cop who also happens to be suave and savvy (think part Dirty Harry, part James Bond), but Weathers nearly pulls it off. The decision not to play him with a 'black-english' accent and with no chip on his shoulder were exactly the qualities needed to leave the whole blaxploitation question away from the film at the time it was made. There are also some important ethnic transgressions here - we first find Vanity as the new mistress of the white bad-guy, whereas it's clear that Sharon stone's character has had a fling with Carl weathers'. Essentially, then, the film portrays a fantasy Detroit, where racism has indeed become a thing of the past that its all but forgotten. If only that were really true! But, again, that was exactly what was needed to get African Americans back into action films - i.e., back into Hollywood. The direction of the film is fairly tight. The characters are so two dimensional, it may not be noticeable but the performances are all pretty solid; the whole film is professionally produced and presented. Also, two years before everybody in America would discover who Jackie Chan was and that he came from somewhere called Hong Kong, there are some terrific stunts in this film. And I noticed that other critics have reported that both Sharon Stone and Vanity get naked in this movie; frankly, I find such comments tasteless. On the other hand, there's no denying the attraction some men will feel for such important examples of women taking proper care of their health. But the main point is, the film should be preserved if for now other reason, than because it was indeed the return to the mainstream of the strong African-American male hero; and we still need that in the cinema, and always have.